This is NOT a list of the 10 best air purifiers! If I posted that list, consisting entirely of hospital and cleanroom grade machines, nobody could afford them. 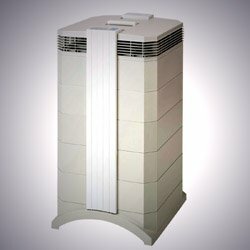 This page is a basic site summary, with short capsule reviews for that majority of buyers who are pressed for time and need an air purifier purchase decision done today. This list goes from top to bottom of the market. Searching for best-value air cleaners, I waded through hundreds of quick-web-riches flukes and found precious few decent sources. Bogus “air cleaner review” and numeric ranking sites abound, using a variety of deceptive marketing practices. My recommendations are based on objective analysis - I don't control the ads displayed, or accept advertising from manufacturers. Despite their serious limitations, I consulted CADR (Clean Air Delivery Rate) reports from AHAM (Association of Home Appliance Manufacturers), and the controversial Consumer Reports (CR) air cleaners rankings. Comprehensive testing may prove impossible, considering the limited quality of results from these institutions. Key websites, among thousands consulted, were; Amazon.com customer reviews, Air-Purifiers-America.com, AllergyBuyersClub.com, allergyconsumerreview.com, epinions.com, consumersearch.com and Reviewboard Magazine. I personally use two air purifiers on my list: IQAir HealthPro Plus, and Honeywell 50250. 1. First do no harm; low out gassing, NO ozone. 2. Serious gas and odor removal is a requirement if health benefits are expected: Air purifying devices with real carbon VOC capability rank higher. 3. Quality construction; case, gaskets, seals, and precision fitting eliminate bypassing and assure high efficiency at filtering sub-micron particles. 4. The design maximizes the lifespan of each air filter stage by allowing independent filter replacement. Ideally this is combined with electronic monitoring of filters. 5. Air cleaner has long filter life, low maintenance requirements, and reasonable operating costs. 6. Purifier produces low noise levels and meaningful air flow rates relative to noise. 7. Manufacturer has a track record, with many purifiers in the field and a reputation for supporting what they sell. Warranty period and average service life are long. This generally means replacement filters are readily availible. 8. Air cleaner is a value in terms of price/performance ratio. Every price range should be included, “models above $1,200 are best”, while true, is not useful to most consumers. The list is generally in order of descending price. 9. No dirt; purifiers and manufacturer should be devoid of class-action suits, high returns, recalls, and consumer complaints. Few legitimate negative consumer reviews on air purifiers. 10. Air cleaning machine is stylish, portable, comfortable, and convenient for consumer use. The above criteria will be used for Air Purifiers throughout the site, as well as for judging those listed here. Air cleaners are virtually without government regulation, a minefield of deceit which currently traps millions of unwary consumers. After considerable study, I feel confident in advocating proven, safe, HEPA technologies combined with carbon adsorption. Only those electronic units which have solved the ozone emissions problem will be considered. Photocatalytic (PCO) air cleaners are growing in popularity and the technology is advancing. However, there are still unanswered questions, so just one is listed here. The air purifier industry is overbuilt, with new manufacturers, especially in China, still trying to gain entry. There are thousands of good air cleaners which do not have enough market share to ever qualify for consideration. It takes many thousands of units sold to support replacement filter and parts inventories. In the "recession" (2009-present), the replacement filters/support issue has gotten worse as many manufacturers slash costs to survive. This reinforces my conviction that obscure brands represent risk. The first group are "allergy shop" marketed premium makes. I recommend premium air cleaners to folks who have severe allergies or environmental illnesses. These companies are long-time quality and sales leaders, and are conservative about changing their products with faddish electronics and unproven cleaning technologies. Machines in group 2, the "Asian Invasion," are gaining popularity at the expense of group one. IQAIR HealthPro Plus, made in Switzerland, is the easy winner in the premium category. A lifetime multiple chemical sensitive, I am a poor boy fer sure, but bought one after months of research for this website. Choose the IQAir HealthPro Plus HEPA; if your health calls for truely clean air, or if top quality goods are your preference. Glowing IQAir reviews, awards, and accolades, are abundant across the web, my full IQAir review lists many. IQAir uses BIG, DEEP, SEALED FILTERS, which capture nearly everything that goes through the purifier. Particle counter testing, done by factory engineers as part of routine but comprehensive quality control on every IOAir, always shows zero particulate in the exhaust. My two IQs, 2007 and 2010, continued to blow "zero" on my particle counter after years of continuous service without a single fault (and NO HEPA replacements). In 2015, I discarded the 2007 version, it needed all new filters and a control module, the cost was prohibitive. Odors and chemicals are sequestered by 5 pounds of activated carbon and alumina based potassium permanganate in the "V5 Cell." I did buy one V5 cell, but stopped buying those when we returned to the country. In 2012 IQAir upgraded to the "New Edition," buyers should be sure not to pay up for "deals" on older models. Is HealthPro Plus perfect? No. I estimate the Clean Air Delivery Rate about 220 CADR, just about mid-powered. Many buyers think the higher price and larger size mean "whole house." I warn buyers NOT to over-install any air purifier, no exceptions. HealthPro Plus is perfect for most bedrooms, no bigger than 260 square feet. In rooms above that size, performance may suffer, or continuous noisy high speed operation could be required. V5 odor cells can develop smells and need unscheduled replacement in heavy aldehyde environments, like near smokers, urban traffic, new furniture or carpeting, perfumes and "air fresheners," but these difficulties run industry-wide today. HealthPros are not as quiet on higher speeds as some Asian designs, but have 6 speeds, we sleep well with number three. Some decorators find the IQ's boxy appearance and larger size unappealing. HealthPros are difficult to move, both with and without the somewhat weak wheels. My opinion is also based on the long term staying power of the company, its market dominance, and its modular designs. Many buyers of lesser machines have found support and replacement filters/parts unavailable after just a couple years. IQAir New Edition HealthPro Plus Air Purifier at Amazon.com. 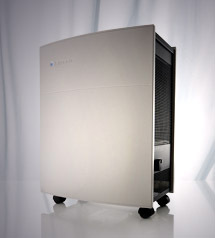 Blueair's unique Swedish-built design created a line of free-breathing air purifiers which are strong, quiet for the power level, and good at particle capture. The heart of most Blueairs is a set of polypropylene hybrid electrostatic filters that allow air to pass while catching particles efficiently. Blueair 503 blows strong enough to rate 375 CADR (450 is max). I recommend the Blueair 503 for rooms to 400 sq. ft., a decent living room. Blueair air purifiers is an established brand, with adequate market share, and good product support. Several Blueairs are designed around the common filters, which are therefore always readily available. The main downsides of Blueairs are frequent, expensive filter replacements required to retain warranty, and the need for occasional cleaning of the air purifier's interior. Blueair 503 is a very good particle collector, ideal for clearing allergens from a room quickly. But not as good on chemicals and odors. Chem/odor problems call for the optional and pricey SmokeStop filters. Blueair 503 "HepaSilent" at Amazon.com. 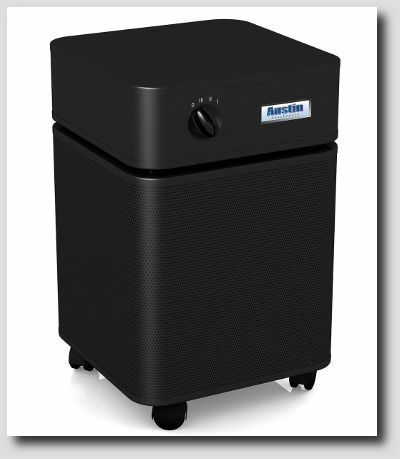 Well built (in Buffalo, New York), Austin air cleaners have been top sellers for decades. Simple manual controls and metal construction combine with conservative design evolution to support long product life and consistent filter availability. Maintenance is very low (vacuum exterior when visible dust accumulates) between filter changes which could be as rare as 3 to 5 years. Austin uses a combined one piece filter, using 60 square feet of Medical Grade True-HEPA filter and 15 pounds of activated carbon, with added zeolite to adsorb chemicals and odors. Austin's one-piece combined filter system is good for a long life where moisture, chemicals, and odors are moderate. The weakness of this carbon-and-HEPA design comes where users overload the carbon part of the set (fresh paint fumes, installed in bath, pool, or sauna), ruining the whole filter. The company rebates filters that fail before the prorated filter warranty (yes it does say filter warranty) expires before the projected 5-year maximum filter life. But users with high-load chem/water/odor/multiple-pet applications might consider another brand, as shipping costs are significant if numerous filters are fouled. A second weak area is noise, 50 dB(A)(decibels) on the lowest speed is too loud for many sleepers. Customer Service is NOT outsourced, it's also based in New York. Healthmate HM-400 Air Purifier at Amazon.com. My second group of recommendations are the "Asian Invasion" brands, made in China and Korea. These have big money engineering, sophisticated electronic automation, and lower ownership costs than group one above. This group is gaining market share, and my admiration, as time goes by. Many have brushless direct current (BLDC) motors, the quietest technology. They use fewer resources and make far less noise and emissions. Rabbit is a successful California importer selling rebranded Coway air purifiers, backed by the best customer service of any importer. Rabbit sells Korean designs with the latest bells and whistles including BLDC motors and sensor driven quiet/economical operation. The new BIOGS 2.0 is getting rave reviews from buyers - 14 verified purchaser reviews at Amazon.com are 100% five stars! Rabbit BIOGS TWO features user friendly, intuitive controls, and offers a sensor driven "Auto Mode." A HEPA filter train with a switchable negative ionizer is the whole show, there are NO sparky electronic grids, plasma ion oxidizers, ultraviolet lamps, and NO ozone emissions. The carbon odor/gas filter has about a pound of carbon, OK for normal homes, but heavy odor or smoking situations can soak a pound of carbon quickly. Rabbit keeps the replacement carbon filters very reasonably priced, and they are easily swapped in. BIOGS TWO comes in two power ratings, "SPA-550A" and "SPA-625A," with the higher-powered 625A running 30 bucks extra. Like the previous BIOGS twins, both BIOGS TWOs share the same chassis and filter train, appearing nearly identical. If your room is smaller than 155 square feet, BIOGS 2.0 SPA-550A is probably OK, but for any larger space, I would go with the stronger version, Rabbit Air BIOGS 2.0 SPA-625A. BIOGS TWO, like its predecessor, is very quiet. And economical, with filter replacement costs around fifty bucks per year and an EPA ENERGY STAR rating. cash-short buyers who could go for a $250 Winix 6300. First time air cleaner buyers, with medium to small rooms, who feel a bit overwhelmed by all the techy info should definitely consider the $370 Rabbit Air BIOGS SPA-550A or $400 BIOGS SPA-625A. The folks at Rabbit are very good at new-customer hand holding and are real Americans, experienced enough for the customer service all users may need. Of course, buyers are paying for this lifetime service with the purchase. Amazon.com purchases ship from and are sold by Rabbit Air, NOT from third party vendors. Rabbit Air BioGS 2.0 (SPA-625A or SPA-550A) at Amazon.com. My full-length review (www.air-purifier-power.com/rabbitairbiogs20spa-550aspa-625areview.html) contains discussion of issues which developed with Chinese manufacturing of the best-selling Rabbit Air BIOGS 1. The new BIOGS 2.0 is well-made in Korea. My preference for Korean products over those made-in-China extends to the Rabbit Air BIOGS 2.0, I expect the new "bunnyaire" to be even more successful than its predecessor. Some folks may be surprised to see the Whirlpool listed under Asian Invasion brands, but it is actually licensed to and made by a Hong Kong company. The identical appearing US model went off the market in 2009, production of a redesigned version resumed (in China) in the spring of 2010. 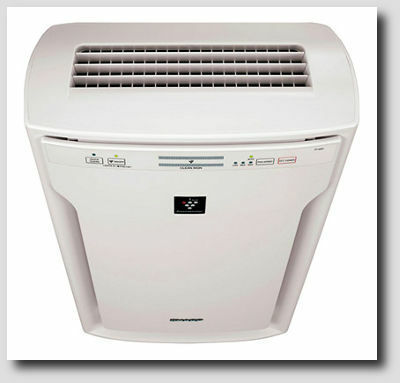 By 2011, the "Whirlpool" air purifiers, including the current 510 model, AP51030K, had returned to the American market. Whirlpool 510 always had a strong fan, and the new Whirlpool is powerful as ever. Sales, while not as robust as the pre-recession US-built 510 saw after the boost from Consumer Reports, are strong. The Whispure AP51030K has an average Clean Air Delivery Rate (CADR) of 316, great for clearing a room, to my recommended maximum of 320 square feet, of particulate allergens, like mold spores or pollen, very quickly. Electronic switching selects from four speed options. On the top speed, AP51030K is noisy, and windy. Some users in warm climates enjoy the breeze, but in a cool room it is "drafty." Charcoal impregnated foam pre-filters precede a True-HEPA filter, but cannot clear strong odor or chemical pollutants effectively. Pre-filter change is scheduled quarterly. Replacement Filter Kits with four Activated Carbon Pre-Filters and one HEPA run $130-$220, depending on vendor. An EPA EnergySTAR rating indicates efficient electricity use. Part of the Whirlpool's redesign is sound insulation baffles made from styrene foam, these emit subtle smells and may not be suitable for the chemically sensitive. But Whirlpool AP51030K is a good choice for seasonal pollen, housedust, or mold allergy sufferers. Whirlpool Whispure AP51030K is available at amazon.com. Sharp Electronics is Japan's long time air purifier market leader, but production has shifted to China over the years. My old favorites are the "dry" Plasmaclusters (some "wet" models have combined humidifiers with water tanks to fill). Plasmacluster FP-A80U is a plasma-ion streamer, producing both positive and negative ions simultaneously. These ions attach to airborne water vapor and create hydroxyl radicals, very strong oxidizers. There is NO ozone, a once popular oxidizing agent which works well but persists in indoor air after use, posing health hazards. Plasmacluster oxidizers are short-lived and are considered much safer than ozone. On newer models, Sharp has eliminated the independent negative ion function. FP-A80U is the top-of-the-line non-humidifying Sharp Plasmacluster, with AHAM-certified Clean Air Delivery Rates (CADR) averaging a very strong 318. Air-purifier-power maximum recommended room size is a hefty 340 sq. ft. The top dry Plasmacluster is automated with auto mode running one dust sensor, which selects fan speed based on particulate levels. A deodorizing prefilter, polyurethane foam with activated charcoal, carries less carbon than older Sharps, necessitating frequent prefilter swaps where odors are present. Annual filter costs run an estimated $135. Energy Star qualified, FP-A80U burns 98 Watts on high fan and a negligible 4.8 Watts on low. Top CADRs, low noise, and low night-time light emissions make Sharp FP-A80U an excellent choice for the bedroom. Sharp FPA80UW Plasmacluster at amazon.com. Winix is a Korean-built value brand, offering lots of air cleaning for the money. Plasmawave is a dual-polarity ion streamer that creates oxidizing radicals in the air near the purifier. These radicals destroy odor molecules and chemical pollutants. In my experience with both brands, Winix PlasmaWave ion streamers are less powerful than the competing Sharp Plasmaclusters. And the new entrant in the plasma streamer space, Friedrich AP260, has a reputation as a strong performing plasma ion setup. Winix WAC6300 is based on the same chassis as all Winix models using the size 20 filter trains. A two-tone silver and gray color scheme distinguishes 6300 from its predecessors 5500 and 5300. 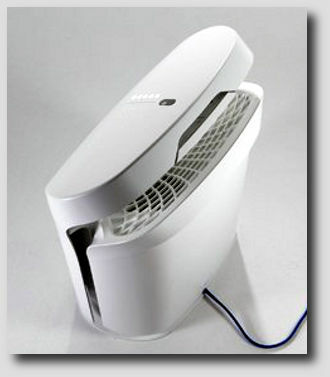 Winix 6300 has automatic operation, which guides a powerful fan through four speeds depending on odor sensed in the air. AHAM certified tests yield a pretty good average Clean Air Delivery Rate (CADR) of 244. I recommend the WAC6300 be installed in a maximum of 250 sq. ft., but users who prefer automatic or low speed operation should downsize that further. A thin carbon impregnated pre-filter is effective at odor control ONLY when replaced often, quarterly is the manufacturer's suggestion. Replacement filter paks include one true-HEPA and four carbon odor filters, sell for about 70 bucks at amazon.com. Odors emanating from the anti-microbial coating on the carbon pre-filters make Winix 6300 unsuitable for the chemically sensitive. Winixes are perfect for those who aren't afraid to cut-to-fit experimental prefilters, and smart buyers may notice that the Fellowes version of the same HEPA filter is several bucks less. 6300 is electricity-frugal, EPA EnergyStar rated, and reasonably quiet. Winix 6300 is a Korean-built value-first air cleaner, a top ten buy for those with limited budgets. My very similar Winix 5300 has run on my desk top, running modified filter trains including the exact-fit Fellowes HEPA, for almost ten years. No under $300 purifier is without many flaws, but I like Winix 6300 better than all Honeywell, Holmes, Hunter, and Bionaire models, not to mention the hundreds of Made-in-China knockoffs, found in the lower price brackets. Winix PlasmaWave WAC6300 at amazon.com. Air purifiers under $300 are recommended primarily for mild allergies or housekeeping purposes. Group 3 products are the low end, most will have issues of one kind or another, despite being listed in my "Top Ten." Some are too loud relative to modest air-cleaning capability. Some antibacterial prefilters exude odors that can bother the chemically sensitive, though these can be quickly and cheaply replaced by do-it-yourself types. In general, air cleaners in the below $300 arena may have a defect rate higher than models listed in the top 2 groups. Economy class air cleaners also have more frequent warranty claims than upscale products. In this category there are many inexpensive products, but I do not list, and buyers should avoid, loss-leaders - low priced machines with high-priced replacement filters. The 14-inch round Honeywell air cleaner has been around for decades. 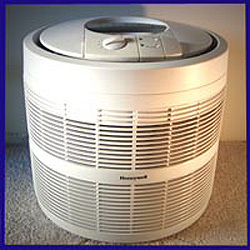 When air purifier sales hit their top, around 2006, Honeywell had about twenty 5000-series models. Today 50250 and its siblings 50150, 50100, and 50300 are the survivors. Honeywell 50250 is the brand's strongest-selling HEPA air purifier, still viable where many models and manufacturers have flopped. Over 1,000 buyer reviews at Amazon.com average "4 stars." Economy, durability, and particulate-focused power are the drivers of this long-running success. There are no fancy electronics, just a three-speed manual switch and a couple lights. An average Clean Air Delivery Rate (CADR) of 250 gives a lot of power for the money. This is a well-sealed true-HEPA with filter life of 1 to 3 years. Users can extend HEPA life with better wrap-around prefilters, as detailed on air-purifier-power.com. Universal Carbon Prefilter #38002: usually under $10, needs replacement at least every 3 months if odor reduction is desired. 50250's prefilter has little VOC gas toxin or heavy odor capability. Simple and sturdy, Honeywell 50250 is lots of air cleaner for the price. The main issue is sound emissions, Honeywell 50250 is not really a good bedroom air cleaner. But, for budget-conscious shoppers, 50250 is a true-HEPA offering effective, reliable, and fast particulate allergen removal in medium rooms to 250 square feet. 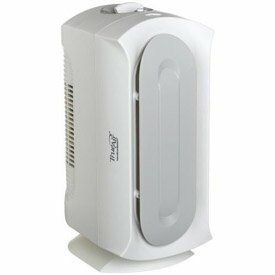 Honeywell 50250-S true-HEPA Air Purifier at amazon.com. When GermGuardian, known for making small UV room sterilizers, announced their air purifier line, I expected poor sales in today's slow air cleaner market. But they proved me wrong. Now a best seller, Germguardian AC4825 has quickly accumulated over 1,100 buyer reviews at Amazon.com, averaging "4.3 stars." 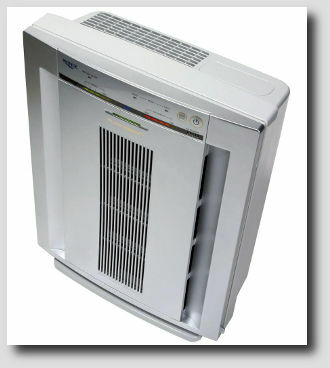 Just 22 inches tall, with estimated Clean Air Delivery Rate of around 100, Germguardian AC4825 is suited to very small rooms and office cubicles. Buyers should not expect good results in rooms larger than 125 sq. 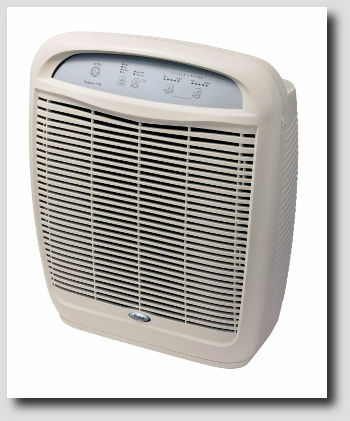 ft.
A true-HEPA filter, rare at this price, is a plus. But the filter is not tightly sealed, allowing some fine dust to leak through, again pretty normal at this price. A 5 Watt UV lamp activates the AC4825's photocatalytic oxidizer grid, offsetting the light carbon in the prefilter for odor reduction. Although 5 Watts UV is not strong, the AC4825 has a good reputation among user reviewers for odor control. The 7 by 10 inch footprint and 8 pound weight make the short Germguardian ideal for cramped spaces. Germ Guardian AC4825 gets widely varying user satisfaction in the noise emissions area. Wobbly fans and spotty overseas quality control are likely to blame. Germguardian AC4825 is about as good as a $100 air cleaner can be, but buyers should expect some flaws. HB 04383 is included in my top ten list to provide an alternative for the less affluent, I am NOT implying it is competitive with models described above. A very popular low-budget air cleaner, Hamilton Beach 04383 has almost 1,700 buyer reviews at amazon.com. That represents many thousands of buyers, plenty of user feedback, with a 4 star average rating. Exclusively marketed at very naive first-time low income buyers, language used informs shoppers that Hamilton 04383's "permanent," "99%," "HEPA-grade" filter "never needs to be replaced." "Just vacuum filter four times a year," under $50, sounds perfect. Woah, Pawdner, there's no such thing as HEPA-grade. Hamilton's 04383 is a three-micron air cleaner, catching "particles as small as 3 microns." THREE microns is TEN times larger than the .3 micron size particulate trapped by real HEPAs, this "loose" filter lets the smaller, more dangerous stuff fly right on through. The manufacturer's title "Allergen-Reducing" (NOT eliminating) describes it well. Small HEPA-type air cleaners usually go through lots of disposable filters, which quickly add up to more than the machine's initial cost. One reason for including the Hamilton in my top ten is low or non-existent filter replacement costs. With fan power blowing only 60 cubic feet per minute (cfm), I recommend HB 04383 and similar Hamiltons for very small rooms only. Despite the fact that Hamilton 04383s remove airborne particles only (not odors, gases, or chemicals), many of those 1,700 user reviews describe "fresh-smelling air" after running this machine. Mold spores have a "musty" odor, which might in fact be reduced. Folks with serious health needs should move up the food chain to a true-HEPA machine. But if cash is scarce, and you suffer from seasonal pollen allergies or mold spore sensitivity, Hamilton 04383 may help, as these allergy triggers are large enough to be captured in the three-micron filter. Hamilton Beach 04383A True Air is available at Amazon.com.